Shoulder pain ruining your workouts? The above left picture is a common fault seen on many rowing variations. This shoulder position is also very common to see on someone’s bench press when the bar is lowered to their chest. This could lead to an angry shoulder and possibly some biceps tendinitis or pain in the front of your shoulder. 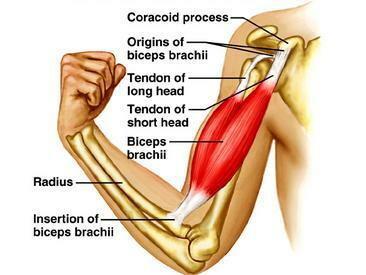 Remember to consider the attachment sites of the long head of biceps. The origin is the superior rim of glenoid and passes down through the greater/lesser tubercle. Because it is a two-joint muscle, it will also flex shoulder which tends to be the provocative motion when symptoms are flared up. Where most people run into trouble with a high volume pressing program, I would argue, is the eccentric stress placed over the biceps tendon (especially if the shoulder is in a forward position). As the bar is lowered, the arm begins to return down to neutral, or possibly past neutral into extension. Thus, the biceps tendon undergoes a lot of stress to decelerate the bar when lowered. If the shoulder is in a forward position, this load is increased because it will put the arm in more extension. This is why the setup is so important. When you set up for a bench press think "pull the shoulders back into the bench", and when you lower the bar down towards the chest think "pull the bar down rather than lower it." Both will help reduce forward glide of the shoulder at the bottom position of the bench press. Here is a great video by Dean Somerset explaining the setup for the bench press. Check out this FREE Sports Injury report and find out 9 ways the pros recover from injury FAST!